ViewSonic revealed its new line-up of 3D-Ready TVs today. Aimed at gamers looking to immerse themselves in their videogames, the FuHuzion line of TVs are an affordable way into the 3D world. Speaking exclusively to TechRadar Sean Gunduz, Senior Product Manager for ViewSonic, believed that the TVs have come at a perfect time to embrace 3D content. "2009 is definitely the year for 3D gaming," Gunduz revealed. "Although the technology has been round for some time, ViewSonic's FuHuzion line makes sure you get the most out of your 3D experience. "New features like 120Hz processing mean that the 3D picture quality has never been smoother." The VX2265wm desktop monitor has to be combined with Nvidia's GeForce 3D Vision stereoscopic glasses to work, and is compatible with over 350 3D games, including Guitar Hero: World Tour. The TV houses 1,680x1,050 resolution, HDCP support and uses SRS Wow HD sound technology. Available at the end of January in the US, the VX2265wm will cost just $399. 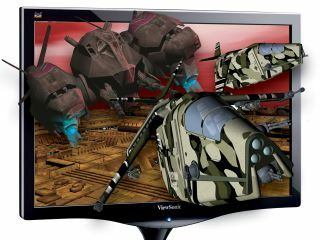 Gunduz also revealed that ViewSonic will be releasing a Full HD FuHuzion monitor some time in the second half of 2008.